As part of a four part blog series exploring the recently adopted Sustainability Framework, the UC Sustainability Office is this month turning its attention to partnerships for sustainability, and there is no better time than Fair Trade Fortnight to explore UC’s partnership with the Fair Trade Association of Australia and New Zealand. 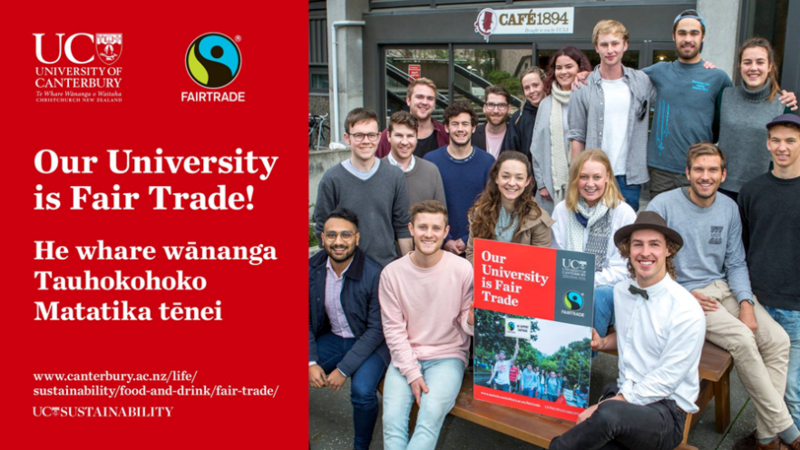 In July 2017, UC became recognised by the FTA as a Fair Trade University, one of only two in Aotearoa New Zealand (and the first entirely Fair Trade campus!). Basically, this means you’re allowed to eat as much chocolate and drink as much coffee on campus as you like, guilt free… because it’s 100% guaranteed Fair Trade certified! But seriously, what does this mean for UC? One of the FTA’s key ‘Minimum Requirements’ of becoming a Fair Trade University, is to provide Fair Trade and World Fair Trade Organisation (WFTO) certified products in as many on-campus cafes and retail outlets as possible. But UC’s commitment to Fair Trade doesn’t end at just coffee and chocolate – Fair Trade drinking chocolate, tea, flavoured barista syrups, sugar, cotton clothing and soft drinks are either available in campus cafes, or in your department kitchens. Start by eating, drinking and wearing your favourite products, and make sure they are fair trade, and ethically sourced. Every Fair Trade or WFTO purchase you make has a massive positive impact on farmers, producers, their families and their communities in developing countries all over the world. Look for the two most widely recognised ethical labels in the world: Fair Trade and WFTO. These labels ensure the ingredients in the product have been sourced in accordance with Fair Trade and WFTO social, economic and environmental standards. This means as a consumer, you can be confident that by purchasing this product, you’re making a real positive difference. 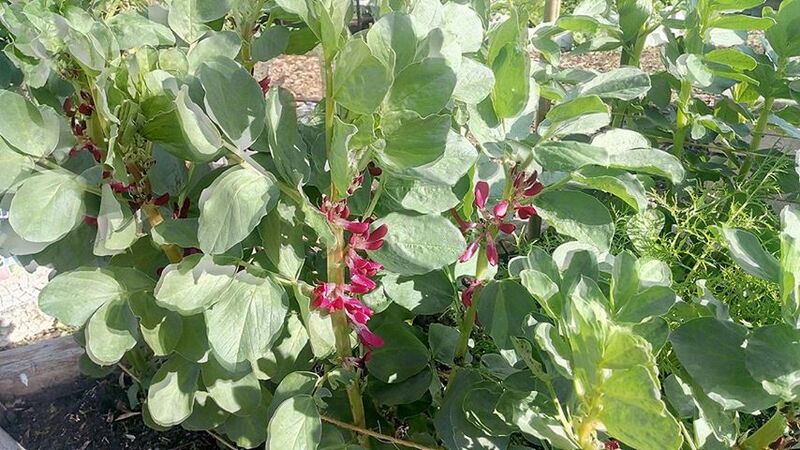 Luckily for us, the UCSA has been supplying us with 100% Fair Trade, organic coffee long before our accreditation, from Common Good Coffee Roasters (formally Jailbreaker), and we’d like to share the story of their coffee beans with you. What’s so special about this Fairtrade coffee on campus, you ask? We’re able to trace the path of our coffee, from bean to cup! For example, the Ethiopian Sidamo coffee bean in your morning coffee comes from Oromia Coffee Farmers’ Cooperative Union (OCFCU), established in 1999 to support a sustainable coffee supply from cooperatives in the Oromia region of Ethiopia. OCFCU supports 360 co-operatives with more than 332,393 farmer-members, accounting for 65% of Ethiopia’s total coffee production. Premiums from coffee exports are returned directly to farmers, and also fund organic farming practices and food security programs. UC is proud to stand with Fair Trade producers and encourage ethical sourcing, through our partnership and recognition with FTA, and our relationship with our Fair Trade suppliers operating through Fair Trade ANZ and WFTO. Want to know more about Fair Trade at UC, and how you, your friends or your department can be involved? Read more here. Don’t forget: It’s Fair Trade Fortnight right now! 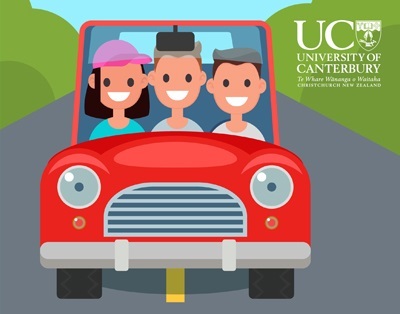 From 3– 16 August, UC is celebrating all things Fair Trade. The Sustainability Office is holding a series of events, talks and activities during the fortnight, and we’d love to see you there! More event information here. 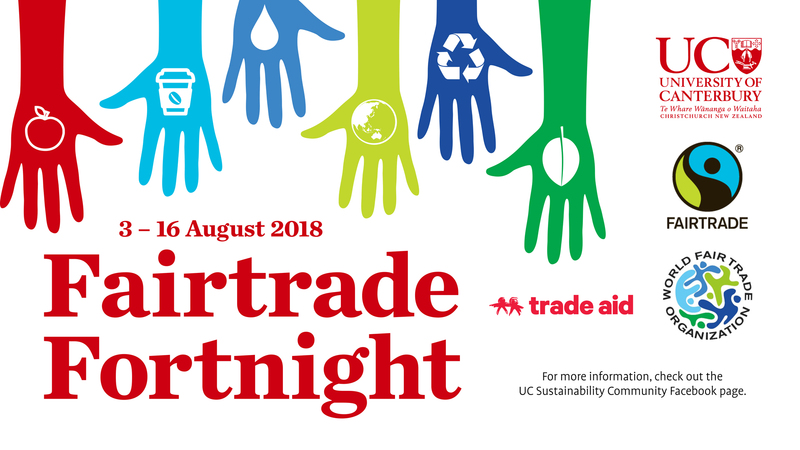 UC has been a Fair Trade Accredited University for over a year now, and we get to celebrate by being part of Fairtrade Fortnight: 3 -16 August. Fairtrade Australia and New Zealand are holding their annual Fairtrade Fortnight in August to raise awareness of all the benefits that fair trade brings. 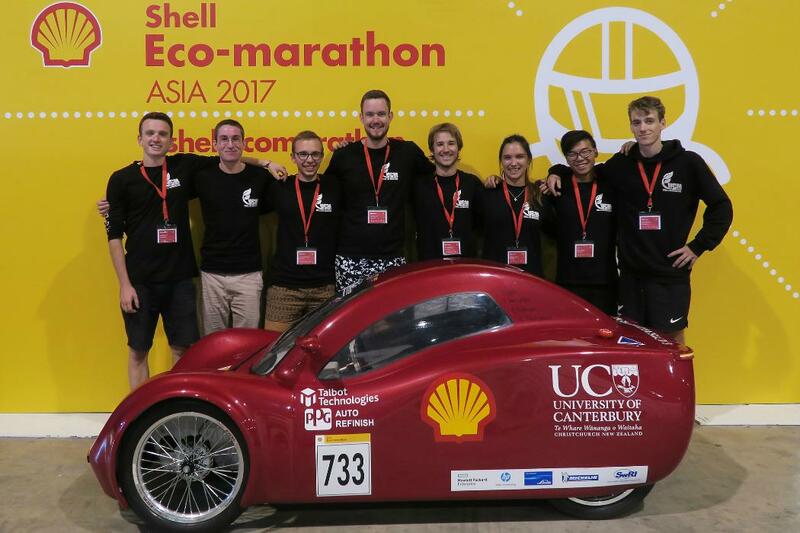 UC Sustainability is joining the celebration by holding several events, presentations and activities on campus throughout the fortnight. Check out some highlights below and follow UC Sustainability on Facebook for all the event details! We’re kicking off Fairtrade Fortnight with an interactive Q&A from Trade Aid, one of New Zealand’s biggest importers of Fair Trade products. It’s the perfect introduction to what fair trade is. Drop in any time during the session, and learn what Trade Aid is doing for fair trade producers around the world. Our second event is close to home, with a one-hour presentation from Samantha Jones, UC alumna and CEO of fair trade clothing company Little Yellow Bird. Sam will be discussing the importance of ethical fashion and knowing where your clothes come from. This event is also sponsored by All Good Bananas, the only fair trade and organic banana company in NZ. During the talk there will be a spot prizes of banana bunches and organic fair trade tee shirts made by Little Yellow Bird (with bananas on them of course). Our biggest event during Fairtrade Fortnight this year is our Fair Trade Fair. It gives staff and students a chance to meet some of the suppliers that helped UC earn their Fair Trade accreditation. The brands and businesses will be sharing how they celebrate and support all things fair trade with stalls, competitions, and giveaways. Expect to try Trade Aid’s delicious chocolate range, sample their tea, coffee and hot chocolates, enjoy free tastings of fair trade soft drinks from Karma Cola, and free iced coffee shots from our coffee supplier Common Good Coffee Roasters. Plus more fair trade giveaways throughout the fair, from local fair trade businesses. And finally, to wrap up Fairtrade Fortnight, we are holding a fair trade film night. We’re screening Indie doco ‘Black Gold’, which explores Ethiopia’s coffee industry, and the ways fair trade can benefit the 15 million coffee workers in the county. Fair Trade hot chocolates and baking will be provided by our wonderful eco volunteer team. See the documentary trailer here. This message was brought to you by the UC Sustainability Office. See all the event details on Facebook or Instagram. 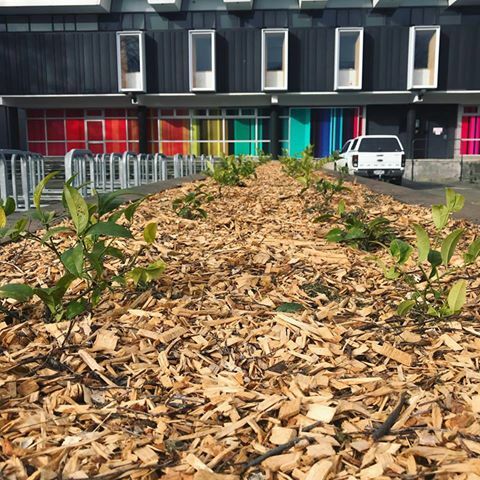 Interested in receiving occasional emails from UC Sustainability? Sign up to our newsletter here.